Maryland style crab cakes with Old Bay Seasoning baked in muffin tins or fried. Oh, I am a lucky, lucky girl. Not only did I have the privilege of being raised in the Deep South where I learned all about Southern cooking, but my mom and her family are from Maryland. So I got all the best recipes the Chesapeake Bay has to offer too. Many a summer were spent on my granddad's boat on the bay catching and then steaming blue crabs (coated in Old Bay seasoning, of course). I think I could pick a blue crab clean before I could ride a bike. My Grandma Betty (who Granddad's boat, The Betty B, was proudly named for) had dozens of slap-yo-mama crab recipes but my very favorite has always been her crab cakes. We made them tonight with the blue crab meat my Uncle Gary brought down during his last visit and they were amazeballs! Combine crab meat, celery and onion in a medium bowl; set aside. In a small bowl add mustard, mayonnaise, egg, parsley, paprika and Old Bay seasoning and mix until thoroughly combined. Add mustard mixture and bread cubes to crab mixture and toss until just combined. Brush the insides of a 12-muffin muffin tin with melted butter. Divide crab mixture evenly into muffin tin (you'll get anywhere from 10-12 crab cakes depending on how big you want them). Bake at 375 degrees for 30 minutes or until golden brown. Let crab cakes rest 5 minutes in the muffin tin. Slide a knife around the edges of each crab cake to loosen then remove each to a serving platter. You can also pan-fry these in vegetable oil if preferred. Can you just bake these on a cookie sheet? I don't think they'd keep their shape. But if you decide to try it, I'd love to know how it turns out! These will bake fine. If they are firm enough to fry, they are firm enough to bake. If you cook them in a panini press, they will fall apart. I'm from Baltimore and we use saltines instead of bread and a hefty couple of dashes of worcestershire sauce. I bake my Maryland Style carb cakes on a cookie sheet and they stay together very well. I also ommit the bread. Up the wet ingredients just slightly. The bread is mostly a binder. Thanks for the great share! Pinning and plan on making your family recipe as soon as I get my hands on LUMP Maryland Blue Crab Meat! Dang, girl! You've got some pinning power! Crab cakes are my favorite and any time they are on a menu I will order them, just to check them out. And I must say there are many many variations!Can you get Blue crab in Michigan? I really have no idea but I don't *think* so. You can use any crab meat in this recipe. It doesn't have to be blue crab. Sam's Club carries crabmeat in their seafood section. It's the only place I can get it in Indianapolis that tastes close to the Maryland beautiful swimmers. The seafood truck should be coming up here again soon. I will be checking to see if they carry blue crab... Hope so! I did something similar about a year ago with baking my crab cakes in muffin tins. It works like a charm. Next time I think I'll try your recipe for a little variation. I made some in mini muffin tins as an appetizer. They were the bomb! Everybody loved them. No celery or onions in true Maryland style crabcakes. Sorry. Not true. I'm from Baltimore and our Moms always looked for a way to stretch the crabmeat. My mom used to use green pepper and celery, but not onions. It's called homestyle. Restaurant style doesn't use any fillers or stretchers. We also use saltines instead of bread and a bunch of worcestershire sauce. I agree, born n raised in Balto, we never ever put veggies in the crab cakes. No sauce on them either. Nothing to interfere with the amazing flavor of the blue crab meat. I can't sign in other than anonymous or I would. I am Lynn from Maryland. Crabcake pic looks good but believe me, no vegetables in true traditional Maryland crabcakes. Well, all of my Maryland family disagrees with ya on that :o) My grandma never lived a day outside of MD and this is her recipe. Oh, and all you have to do is select 'Name/URL" and type in a name - no URL required. true crab cakes have no veges and I am from Michigan. Everyone.s taste is different so we add what we like to enhance the flavor. I never order them when I am out for dinner as I know I will be disappointed. The ones you make at home are so much better. This sounds like a good recipe, I will try it. Really! You would spend your time aring this,make these any darn way you like.These were really good. I am from Maryland and have lived here all of my life 70 years. This is the kind of crab cake recipe I was raised on. So good to see a traditional Maryland Crab Cake recipe. We are famous for our Maryland Blue Crab Cake recipes. I believe all of you are correct based on where you and your families are located and from. Some areas of Maryland and the Chesapeake Bay have just made crabcakes differently. The Bay is as huge as the world of cooks and recipes. Keep cooking and smiling friends! I've never met a crab cake i liked. Nothing compares to the taste of just plain crab dipped in lemon juice, salt and pepper. I think the "minimalistic" mayonnaise, Worcestershire, olive oil, etc. already distracts too much from the taste and texture of crab. HA! I'm the same way! I never EVER order crab cakes in restaurants because any time I ever have, I've always been disappointed. Thanks for your comment! Just discovered your website and I've already found so many fabulous recipes that sound just like home. Want to try the Maryland crab cakes made in the muffin tins (they catch blue crabs here in the florida panhandle but good crab cakes are hard to find). Would love to see more of your mother's recipes that feature crab or that were common to the Chesapeake Bay area. Thanks. I'm a "kid" from Canada...no idea what's right or wrong making crabby patties...but so far anything I've made on your blog are stupid awesome... So...like always...going for it...thanks for expanding my horizons AND waste line. ;). You ROCK!!! Never heard of parsley and green pepper in Maryland Crab cakes. 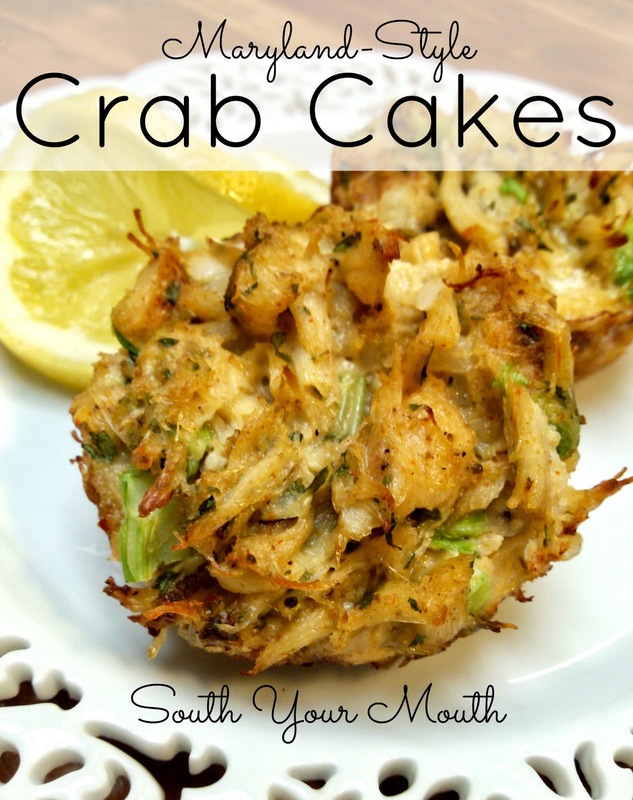 As many times as I have looked at this site, I can't believe I missed this crab cake recipe. I grew up about 20 minutes from the Chesapeake Bay and have personal preference for crab cakes, but this looks like a good one. I don't use any onion as I think it overpowers the delicate crab taste, but to each their own. Also never baked one, but I might try it next time I get home to visit and pick up some good crab meat. The only thing better than a good crab cake is a crab imperial stuffed shrimp made with homemade mayo. Put that under your broiler and give it a try! Hi, can these crab cakes be made a day ahead of time and reheated? Yes! They're not quite as good but they're still mighty fine! Do you use a regular size muffin tin or a mini size tin? You can use either but if you use the smaller ones reduce the baking time. I grew up in Benedict MD on the Patuxent river. I ate crab all my life. I now live in South Texas and would die for a real Maryland crab cake, any of the above recipes will do. Peacekeeper Deb is correct. Families all over Maryland make crab cakes just a tad bit different from each other. Keep picking, cooking & smiling. I do get very good shrimp here and homemade tortillas. I've been making my grandmother's crab cakes for over 40 years. She was a tavern cook in Baltimore in the 1940's. Her secret was to refrigerate her crab cakes for at least 2 hours or overnight before broiling. This way they wouldn't fall apart. My favoriat method is deep fried.